SYCAMORE TOWNSHIP, Ohio -- Ray and Tine Wene are focused on keeping life as normal as possible. Last year, Ray Wene learned he had a glioblastoma. That's the same type of brain tumor Sen. John McCain has been fighting. The tumors are "insidious," Dr. Vincent DiNapoli said. "They live with in the brain itself and they're very enmeshed in the normal brain." DiNapoli is Wene's neurosurgeon and director of the Brain Tumor Center at Jewish Hospital Mercy Health. 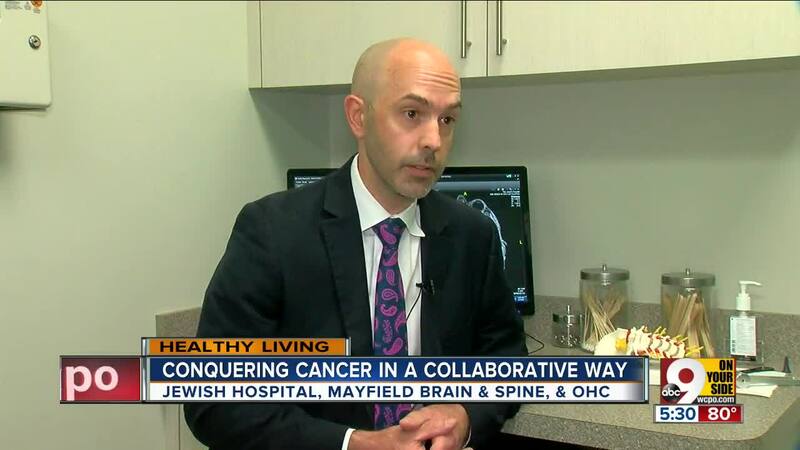 The center is a new collaboration drawing on the expertise of medical professionals at Jewish, Mayfield Brain and Spine, and Oncology Hematology Care. The goal is to offer the best surgery and post-operative care for people like Wene. In 2015, the Centers for Disease Control and Prevention reported more than 22,000 new brain cancer cases in the United States. That same year, about 16,000 people died from brain cancer. Mercy Health has invested $15 million in the center, which offers 22 physicians over a range of specialties with deep experience. For example over the last 25 years, Mayfield doctors have performed nearly 10,000 brain tumor cases. And doctors with Oncology Hematology Care specialize in nearly every form of adult cancer and complex blood disorder. The center offers the region's only Gamma Knife ICON radiosurgery program, with an accuracy of .3 millimeters while delivering a lower dose of radiation to healthy tissue than other technologies. "And then looking forward, we need to try and develop new things to provide hope that we can eventually cure this," DiNapoli said. Wene and his wife already had great things to say about their experience at Jewish, and they believe bringing together bright minds, along with medical technological innovation, can only mean good things for people undergoing treatment. He's already had surgery, but he knows his battle continues. So he and his family trust their faith and the people working to cure his cancer in a collaborative way. "I guess I'm more of a fighter than anything, and I want to see me kids grow, see them have kids of their own," he said.